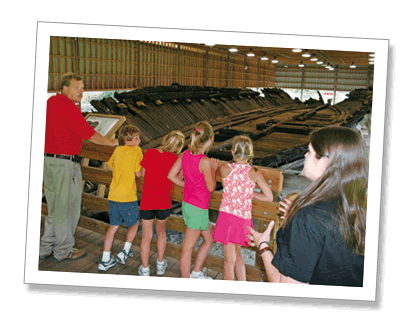 VisitKinston.com invites you and your students to escape the confines of your classroom and discover the adventures that await you in Kinston and Lenoir County. Our Educational Adventures offer exciting learning experiences for every age group and a broad range of activities from exploring Civil War battlefields to star gazing. Educational Adventures are fun filled educational and interactive activities that complement seven fields of study. As you begin planning field trips, the VisitKinston staff stands ready to assist with your field trip preparations. We will be happy to assist you with customized tour packaging including accommodations, itineraries and group meals. To begin planning your trip email us or call 1-800-869-0032. We look forward to having your group VisitKinston! Educational Adventures is a program coordinated by the staff of VisitKinston.com, located in the Kinston-Lenoir County Chamber of Commerce building. The focus of this program is to provide local learning adventures. The VisitKinston staff will be happy to do the work for you! Want to know more about the program? Contact us at 800-869-0032 or 252-523-2500. Students can experience fun filled educational and interactive activities that complement six fields of study. interest. Field trips may be tailored to meet your needs. Call us at 800-869-0032 or 252-523-2500 or email us to request additional information for some sites such as a Teacher’s packet, brochures and a county map. 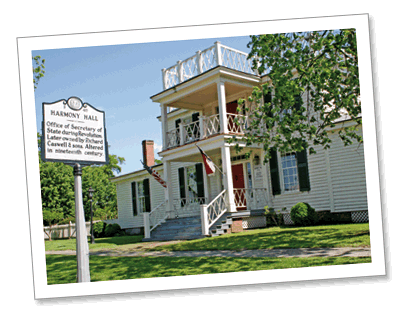 The Kinston-Lenoir County Visitors and Information Center is located on the historic battlefield of the First Battle of Kinston. Indoor and outdoor displays are representative of the 1862 First Battle of Kinston and the Civil War. A 30 sq. ft. fiber optic map of Lenoir County and the surrounding area interprets the North Carolina Blue-Gray Scenic Byway. In the 50-seat auditorium students and visitors may relax and enjoy educational films featuring Lenoir County attractions, the Blue-Gray Scenic Byway, and the First Battle of Kinston. Amenities available include restrooms, vending area, wireless internet, maps and visitor information. Open Monday – Friday 9-5, Saturday 10-5, Sunday 1-5. Restrooms and Wireless internet service available. 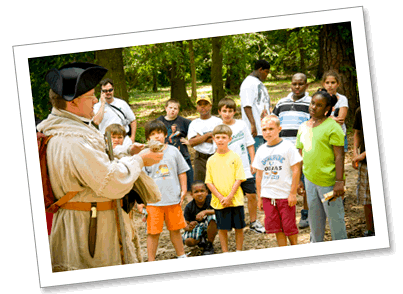 Students will experience a Revolutionary Adventure as on site historians offer living history presentations of life in colonial days. Here, students will learn about the life of Richard Caswell, North Carolina’s first state governor, view various exhibits reflecting his life, which are inclusive of furniture, surveying equipment, weapons, personal belongings and a recreated copy of General Caswell’s Revolutionary War uniform. Interpretive signs at the Caswell Family Cemetery, located near the museum provide information about the Caswell family and the mystery surrounding Governor Caswell’s burial site. A gift shop and restrooms are available in the museum. Students will learn the story of the CSS Neuse Confederate Ironclad Gunboat thru interpretive displays and museum curators. They will have an opportunity to discuss the danger, responsibilities, and hardships of a sailor’s life in the 1860’s. Authentic relics taken from the CSS Neuse are on display. Students will be captivated by the story of the CSS Neuse Ironclad’s short life and her eventual 100 year sleep beneath the waters of the Neuse River as they view the remains of the relic. One of only three Civil War Ironclads known to be in existence today. Time: Allow 1- 1 1/2 hours for tour and demonstrations, which are available with prior request. Students will board a full size facsimile of an Ironclad, the CSS Neuse. Their personal tour guide will make history come alive as he describes the daily activities and responsibilities of a sailor in the 1860’s. As they tour the ironclad, students will have an opportunity to discuss maritime warfare vessels and technology in the 1860’s and experience the life of a Civil War sailor. Historic Harmony Hall became the defacto capital of North Carolina during the Revolutionary War when Gov. Richard Caswell moved the State’s office and government meetings to the house in 1777. Caswell knew that Tryon Palace was very vulnerable to British attack therefore he had the records moved to the safety of Harmony Hall. On site docents will relate Harmony Hall’s intriguing history and encourage students to imagine the historical events that have taken place inside Harmony Hall over the last two centuries. Tours will focus on the lives of the people that called Harmony Hall home. An early 1900’s schoolhouse sits at the rear of the property complete with desk and blackboard. Here students may experience what it was like to attend a one-room schoolhouse as they sit in a desk and are transformed by the surroundings to days gone by. Time: Approximately one to two hours. Tour time will vary according to size of group and interest. Students will be immersed in history as they visit the battlefield where the First Battle of Kinston took place in December 1862. A beautifully landscaped area, period fencing and flags, interpretive signage, state and regimental markers mark the site where soldiers battled and cannons roared. An on site tour guide will tell the story of the battle and encourage students to ask questions about the battle, the soldiers and the surrounding battlefield. Students will have an opportunity to explore the battlefield and walk atop the simulated berm, representative of the breastworks that were used for protection during the battle. Reenactors may be present to offer demonstrations of camp life, weapons, medical care, dress and entertainment appropriate to the civil war period. Harriet’s Chapel Site – An old church on the battlefield where the heat of the battle took place. Harriet’s Chapel was used as a defensive position before the battle and a hospital after the battle. Starr’s Battery Site –Captain Joseph Starr at this position commanded a crew operating for six cannons surrounded by still existing earthworks. Brochures, CD’s and Podcast are available for driving tours providing the history of the battle as it relates to each of the 12 tour stops. In the late 1800’s fire fighting was a somewhat disorganized but passionate endeavor. Competing fire companies sometimes engaged in fistfight to decide who would put out a fire. This vivid history comes alive as students enter the world of the late 1800s fire fighter. The Caswell No. 1 Fire Station was built in 1865 after a disastrous fire destroyed much of the downtown Kinston area. Students are encouraged to compare fire-fighting equipment dating from the 1800’s to the modern fire equipment we have today. 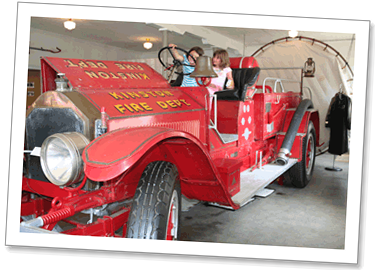 A 1922 American La France Pumper that once protected the citizens of Kinston from fire is the focus of the museum. 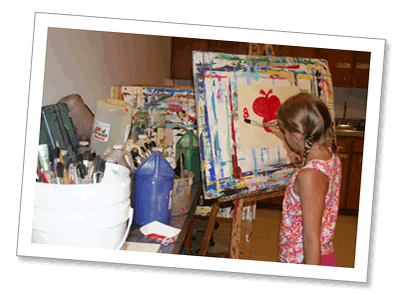 Recognized nationally as a leading visual arts center, the Community Council for the Arts offers a variety of programs for students. Exhibitions by nationally and regionally acclaimed artists enhance students awareness of visual arts. As many as 300 works by local, regional and national artists are on display throughout the year. A favorite permanent exhibit that thrills both the young and old is the large detailed train display. Gift shop and rest rooms available. The Stroud House, home to the Caswell Developmental Museum & Visitors Center, built in the 1800’s once was the main house of a plantation. In 1911 Dr. Ira Hardy opened the state’s first residential facility for mental retardation. The museum shows institutional life from the early 1900’s to the present through a collection of historical information and artifacts. These displays tell the Caswell Center story and relate it’s place in the history of Kinston, Lenoir County and North Carolina. The museum is invaluable to individuals or groups interested in tracing the early development of services for persons with developmental disabilities. Take a walk on the wild side! Here’s a safe, entertaining and educational place for children that will capture their adventurous spirit. Exhibits include snakes, alligators, raccoons, osprey, and a red tailed hawk. Children and adults will gaze with wonder at the galactic shows offered in the 52 seat planetarium. Kids will love the fun and never realize they are learning as they crawl through giant models of intestines, mouth, stomach and an underground tunnel of blood vessels. They will love the bubble machine and other hands-on health and science exhibits designed to teach and amuse. Guided tours can be custom designed to meet curriculum needs. Restrooms, picnic tables and playground are available on site. Group size will be limited according to sites and activities selected. The 52-seat planetarium also serves as a video screen for content including the NASA channel. Various planetarium shows are held daily and are subject to change periodically. The shows are formulated to follow the state’s curriculum guidelines for the 3rd, 6th and 9th grades but can also be custom designed to fit your needs. This 5000-square-foot museum features hands-on health and science exhibits and programs. Students may play a “giant” Operation game, or crawl into miniature replica of Lenoir Memorial Hospital, an underground tunnel that portrays itself as a human blood vessel, and a replica of the mouth, stomach, and intestines. Exhibits may change periodically. Get your hands wet investigating a salt-water touch tank. Explore numerous exhibits of plants and animals indigenous to North Carolina, including live poisonous and non-poisonous snakes, flying squirrels, talking birds, bears, bobcats and more. (Souvenirs are available for purchase.) Venture into the cave in the lower level where you will find live turtles, caiman, mineral exhibits, nocturnal animal displays and aquariums depicting life along the full course of the Neuse River. 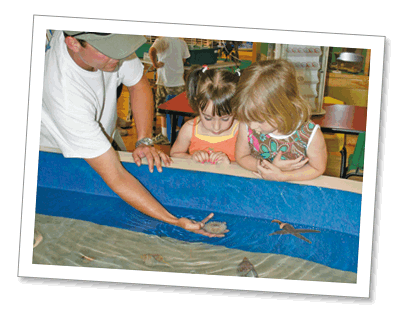 Our salt water touch tank provides an opportunity to see and touch sea urchins, scallops, crabs, tunicates and skates. Mount exhibits includes bears, deer, turkeys, beavers, snakes and more. You can also see live snakes, poisonous and non-poisonous, lizards, spiders and scorpions. Students will be amazed as they enter “Underground Cave” and see live caiman, turtles, iguanas, bearded dragons, frogs, mineral exhibits, crayfish, and aquariums filled with fish from the local Neuse River. Don’t forget to have your students visit the World’s Most Dangerous Creature! Self-guided trails are located adjacent to the Neuse River near the campground. 16’ Mohawk canoes, oars and life jackets can be reserved by calling (252) 939-3367. This miniature replica of a coal mining train will take children and adults on a fun ride for a small fare. Admission: Free for entrance to Nature Center, Planetarium and Health & Science Museum. Official Field Trip package with guide is $2 per student (teachers and chaperones are free). Time: Length of time at each venue will vary according to size of group and specific interest. Field trips may be tailored to meet your needs.